Geibig, 28, is a student in Kellogg Community College’s Agricultural Operations Program. A partnership with Michigan State University that launched last fall, the program offers students the opportunity to earn an Associate in General Studies degree at KCC while simultaneously earning an Agricultural Operations Certificate through MSU, with all coursework completed entirely at KCC. Additionally, each Agricultural Operations student must complete a summer internship before graduating. 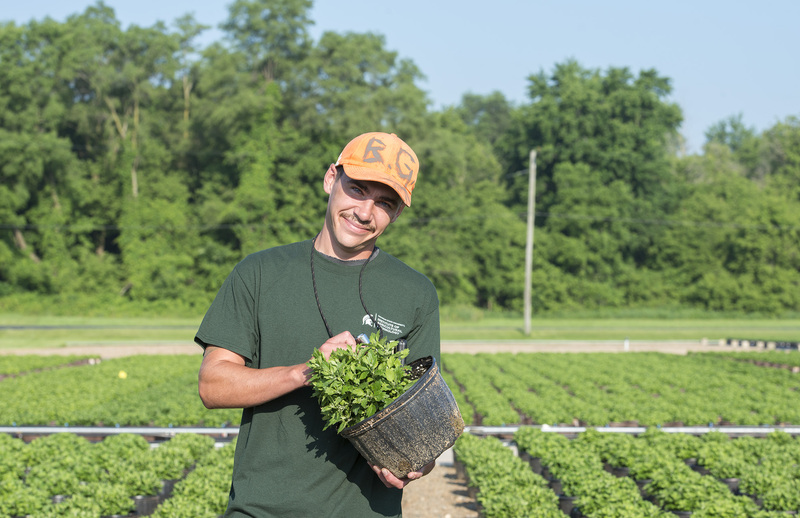 Geibig is in the internship portion of the program now, working in fields and greenhouses around the state with West Michigan IPM (integrated pest management) to help identify and monitor pests that could potentially harm plants. Geibig, of Delton, is a 2010 graduate of Delton-Kellogg High School. He started taking community college classes right out of high school, working at the same time. It was while working in at an assisted living facility that he was first introduced to working in agriculture, maintaining a vegetable garden where he helped grow tomatoes, Brussels sprouts, broccoli and other crops. He eventually heard about KCC’s new Agricultural Operations Program and signed up just a week or two before the first classes started. This spring, Geibig finished up his Associate in General Studies degree at KCC, and he says he’s open to different opportunities once he finishes the Agricultural Operations Program. “Long-term goals would probably be to own and operate my own organic operation in some capacity, probably primarily focused in beef cattle, grass-fed,” Geibig says. He also likes what he’s doing now in his internship, working in pest management. Mark Crossley, of Plainwell, owns West Michigan IPM, teaches entomology for the Agricultural Operations Program and supervises Geibig during his internship. Crossley says Geibig caught on really quick in his training in the field, which has real benefits over simply learning from a textbook in the classroom. Geibig, who considers himself more of a visual learner, agrees.